After college, Barry Goldwater Jr. decided to become a stockbroker, while his best friend studied to be a doctor. Their lives diverged from this point forward — and so did their income. 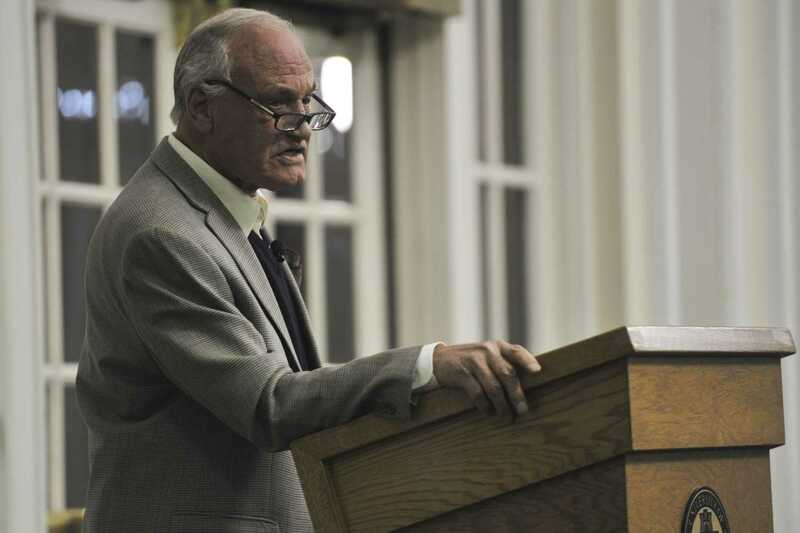 Barry Goldwater Jr., a former Republican member of the United States House of Representatives, spoke to students in the William Pitt Union Lower Lounge Wednesday night. His speech — hosted and organized by Pitt Students for Liberty and Young Americans for Liberty — gave audience members a glimpse of his childhood, career and current political views. Vice President of Pitt Students for Liberty, Jeremy Reiff, was excited to host Goldwater at Pitt. The sophomore physics and mathematical economics major felt it would be an opportunity for people to hear from someone who actually contributed to the libertarian movement. Reiff also said Goldwater Jr. would be an ideal person to clear up any misconceptions people may have about libertarianism. Goldwater Jr.’s father, Barry Goldwater, was a five-term U.S. Senator from Arizona and ran in the 1964 election against Lyndon B. Johnson as the Republican party’s nominee. Goldwater Jr.’s father played a large role in his son’s life thereafter, according to the guest speaker. Goldwater Jr. went on to express his beliefs in the role the government should play in citizen’s lives. His suggestions were widespread with ideas such as stimulating economic growth to create jobs for the poor, taking the regulatory shackles off of small business and limited government — all of which he thinks are absent in present day America. Goldwater Jr. also gave a brief personal summary of today’s political climate and even cited the 2016 election — giving reasons for why President Donald Trump won the presidential race. Goldwater Jr.’s speech drew loud applauses and laughter, and left undecided first-year Anfeznee La Cruz with a positive impression of the event. La Cruz didn’t have many expectations going into the speech being that he was unfamiliar with the Goldwater family, but he nonetheless was provoked by Goldwater Jr.’s words. Kate Ranck, a sophomore math major, offered a similar reaction to Goldwater Jr.’s speech. Despite minimal prior knowledge of Goldwater Jr., she was still able to connect with his perspective. “As a libertarian, I agree with most of what he said. He didn’t really have any hot takes on any political issues, so I more enjoyed his anecdotal stories,” Ranck said.